"... they rode through the city, accompanied by numbers in various grotesque dresses, making disport and merriment; some clothed in armour; others, dressed as devils, chased the people, and sorely affrighted the women and children; others wearing skin dresses, and counterfeiting bears, wolves, lions, and other animals, and endeavoring to imitate the animals they represented, in roaring and raving, alarming the cowardly and appalling the stoutest hearts." Don't be fooled by those dainty hand-on-hip poses. 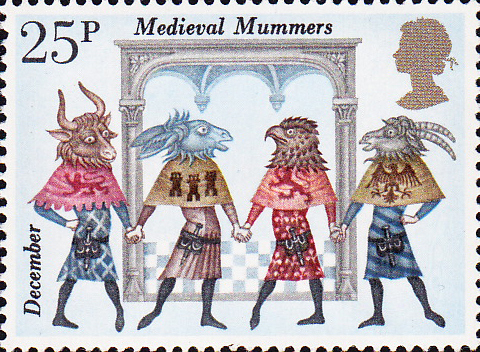 Fifteenth-century revelry during the 12 days of Christmas meant the masked and costumed mummers (versions of which exist worldwide throughout history) not only acting out genteel folk dramas and parading through the streets, but also getting up to all kinds of mischief, drunken loutishness, crime and violence. Nothing changes then - it's just the costumes aren't as good.